It's a small world. How many times have you said that? I began to realize just how small when I truly became immersed in the world of blues long ago. As I discovered more and more artists that were bitten by the blues bug and learned the back history and actual roots of the genre, I also found a new family, a worldwide family. How exciting the prospect was to know that so many around the globe were not only hypnotized by the blues like me but had our eyes and arms passionately opened wide. That knowing feeling of acceptance as a blues brother or sister is unrivaled. And the world is getting smaller... those degrees of separation are becoming less. Social media certainly has a lot to do with it anymore. Why, I just foundout a few days ago, after years of running into him and sharing stages with him, that Little Charlie Baty and I went to the same high school at the same time. Had my mother not remarried and whisked me away... ah, who knows what the blues cards might have dealt. We're offering a Summer Special on non-festival Banner Ads on our website. Your Vertical, Double Banner Ad (125 pixels wide x 250 pixels high) will appear on the homepage of our top-ranking website for half price during the months of June, July and August. Advertising with us is easy, effective, affordable and fun. We can also make your banner ad for you at no additional charge. The Digital Edition of the 2014 BLUES FESTIVAL GUIDE Magazine is now live online. Log onto our website and enjoy all 98 pages jam-packed with blues news, history, lifestyle and of course, FESTIVALS! Check out Samantha Fish and Mike Zito on our cover and over 85 Festivals featured in the Festival Section with hundreds more in the Calendar. 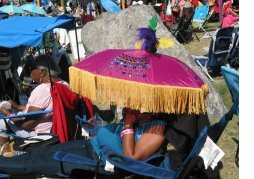 Read entertaining and educational stories by blues aficionados. 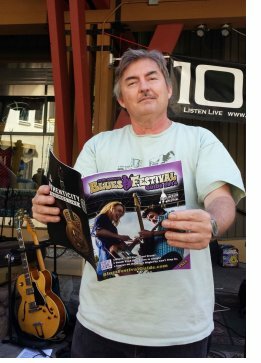 The Blues Festival Guide magazine comes in handy year-round to plan weekends and vacations, find and listen to blues radio stations, and find regional Blues Society calenders while on the road. Advertiser supported, the GUIDE remains free! Please support our advertisers! This year’s magazine is sponsored by the Jackson Rhythm & Blues Festival, held Aug 15-16, 2014 in Jackson, MS.
Our BFG Sales guru Cheryl O'Grady Yearnshaw and her husband Tom Yearnshaw caught up with Little Charlie Baty on a break, June 22, at Bluesday At Squaw, Squaw Valley California. 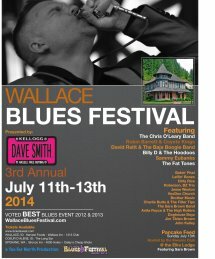 Wallace, ID - Again this July, you will want to be surrounded by mountains in the most fascinating small town in America, historic Wallace, Idaho, as you listen to blues artists perform on multiple stages. On Friday, July 11, they will close streets to traffic so that you may enjoy outdoor Blues at: The Red Light Garage (deck), the Cedar Street Stage (between Metals & Dayrock Bars), and The Fainting Goat, a new music venue. 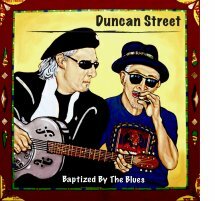 On Saturday, July 12, there will be Blues everywhere in town all day long, beginning on the Cedar Street Stage at 11AM. 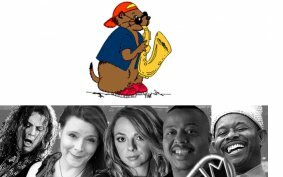 Prairie du Chien, WI – The Prairie Dog is one of the most laid-back blues festivals out there! This year's July 25-26 festival features: Big N’ Tasty Blues, Howard & The White Boys, Big James & The Chicago Playboys, Samantha Fish, Ori Naftaly Band, 88 M.P.H., The Cashbox Kings, Jimmi & The Band of Souls, Lil’ Ed & The Blues Imperials, Carolyn Wonderland, Anthony Gomes, and the Lionel Young Band. Midland, TX - More Blues than the West Texas sky, the Tall City Blues Fest 2014 features 17 performances! 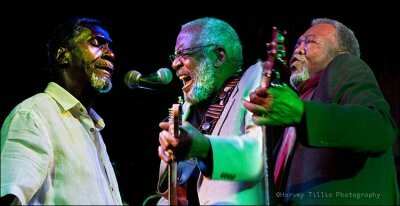 Jackson, MS - The Jackson Rhythm and Blues Festival is set for its second year to celebrate its culture and rich musical heritage. This premier two-day music festival will be held August 15-16, 2014 and offers a stellar music mix and line up with over 30 Artists, including Ziggy Marley, FANTASiA, Bell Biv Devoe, Boney James, Bobby Rush, Denise LaSalle, Dorothy Moore, Estelle and Chrisette Michele, guaranteeing a good Jackson, Mississippi time. There are 5 stages, including 3 indoor, air-conditioned venues, transformed into Juke Joints - “Find your Soul!” The Soul of the festival rests on the rustic grounds of the perfect backdrop of history and culture that lends itself to the music. Cadiz, OH - Saturday, June 28, starting at 4 pm. 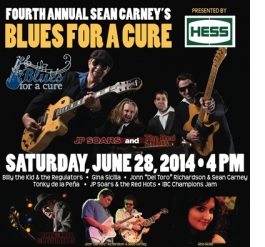 Hess Energy presents the Third Annual Sean Carney’s Blues For A Cure 2014 – Harrison County. 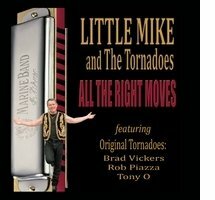 The free public concert will be held at Sally Buffalo Park, Wallace Lodge Stage, 100 College Way, Cadiz, OH 43907. Any proceeds benefit Harrison Community Hospital Foundation Cancer Awareness and Education Fund and American Cancer Society Harrison County Relay Teams. 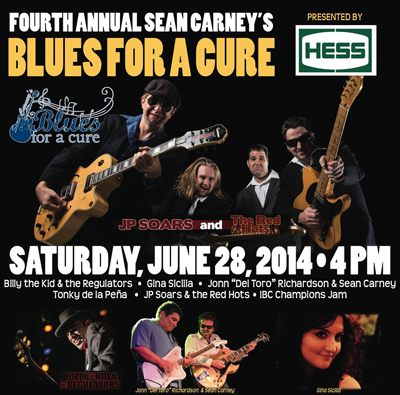 Featuring three International Blues Challenge “Albert King” guitarist award winners, Sean Carney, Jonn “Del Toro” Richardson and JP Soars, along with local rising star Billy The Kid, who along with his band, The Regulators, placed third in this year’s IBC competition in Memphis, TN. 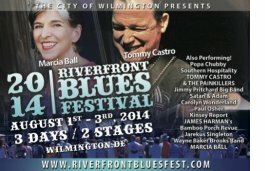 Also joining in will be legendary Spanish guitarist Tonky de la Peña and Blues goddess Gina Sicilia. The National Endowment for the Arts is honoring nine new recipients of the National Heritage Fellowships. 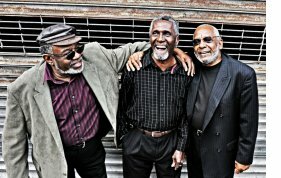 Included in those nine are The Holmes Brothers band. The arts agency says the honorees announced Wednesday, June 25 were chosen for their artistic excellence and their efforts to conserve American culture. 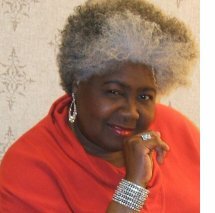 They will be honored at awards ceremonies in Washington later this year. LRBC 25 "Big Easy Fantasy" Oct 24-31, 2015 Prebook begins June 24 @ 11AM CDT.Go Bluesin’ with 20 plus bands and 1800 of your closest music friends from Ft. Lauderdale to Key West (Fantasy Fest Finale), New Orleans, LA, and Cozumel, MX on the Holland America ms Westerdam. $250 deposit per cabin holds your space in line to book a stateroom once the artist lineup and pricing details have been announced. You will receive the announcement likely in November with instructions on how and when to reserve your cabin. Your $250 deposit is fully refundable up to 30 days after the announcement is made or until you select your cabin. Visit the website or call (816) 753-7979. Got Name on HOF Donor Wall? June 30th Deadline! 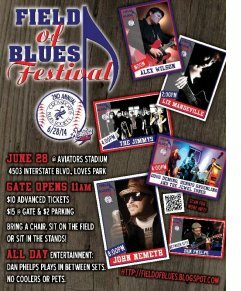 Love's Park, IL - The Second Annual Field of Blues Festival will be held June 28 at Rockford Aviators Stadium on Love's Park, Illinois. Featuring 2014 Blues Music Award-winning John Nemeth and four other great national and regional blues acts, $10 advanced tickets are still available. The event is sponsored by Crossroads Blues Society who are raising funds for their Blues in the Schools music programs. Bring a chair and sit on the field or pick out a seat in the stands and have a great time listening to the blues from noon until 9:30 p.m. The always-bold blues singer Janiva Magness gets even bolder. Her new release is called Original. With more original songs. And on her own record label. She is a woman on a mission. 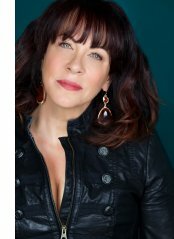 Janiva Magness rides with Elwood, next time in the Bluesmobile.